Could service in an airlines’ economy class be far better than those in business class of other airlines—where pilots and flight personnel are so caring they operate as one solid team with the management, each team respecting each other’s differences? Could this be a standard that will trigger a new meaning in the dictionary associating the people of that airlines’ host country to extraordinary caring people? Could that be our very own airlines? But first let me cite how learning from other industries can benefit a company or even a country. Apple’s legendary founder, Steve Jobs, included different font designs in the first Mac programs based on the calligraphy class he took in 1972 when he was at Reed College. Rob McEwan, CEO of Goldcorp Canada, got the idea of publicly posting information about his mine site from the Linus open source operating system while he was taking a course at MIT. This innovative procurement method led to billions of new gold discovery with help from over a thousand international geologists and scientists who were not even known to them prior to the public post. The late Dr. G. Ventakaswamy, founder of Aravind Eye Hospital of India,studied McDonald’s in order to implement their assembly line concept which allowed one doctor to operate on 50 patients a day with only two assistants, part of his vision of preventing unnecessary blindness in a country with over 12 million blind people. There is wisdom in studying other industries and finding the next practices instead of falling in love with best practices within your industry, which could result in core rigidity when one becomes obsessed with being the best and most modern player in the world of status quo. Consider the pharmaceutical industry which only created a negative 0.3 value between 2000 to 2007 (source: BCG). Using the same pharmaceutical marketing mix that pharmaceutical executives are used to, a reflection is needed whether long experience in pharmaceutical industry is actually a plus or has become a hindrance to radical new thinking called business model innovation. But how does one innovate by learning from other industries? Let us cite some possibilities. Can the mighty banks operate like the lowly gasoline station? By connecting the dots, we can start imagining innovation in service where customers can stay in the safety of their cars and will just hand over their deposits or withdrawals to the shop cashier when it is their turn. Can training companies operate like a church? That’s what my new company, Day 8 Business Academy, Inc., (www.day8.org ) did when it launched the “Pay What You Want” campaign and attracted some 400 SME business owners on its first three weeks alone! Can Philippine Airlines (PAL) imagine itself operating like the lowly soaps? Remember Dove at one time launched the “Be Yourself” campaign where they redefined beauty via showing women of all shapes and colors as beautiful? If PAL can’t convince their flight personnel to agree on lowering the age limit for retirement and can’t match the profile of the Singapore Girl, perhaps, it would be good to take a look at its option, including the possibility of redefining what caring service means—the Pinoy way, from men and women of all ages and shapes, with one commonality—their unconditional attention, patience and caring attitude to economy passengers normally experienced only in business class! This may even be the tipping point of introducing Filipino innovation to the world since PAL is already operating globally. Imagine regaining the Pinoy sense of pride as a nation when the word Filipina, once wrongly described as a house help in a foreign dictionary, would be repositioned to mean an extraordinary caring individual because of an airline’s influence as the Filipinos’ window to the world? It takes a vision of possibility thinking to effect in-depth cultural change and mission-orientation that can bind people together for a common cause. It takes top management’s indispensable and tangible support. It also entails having concrete tools, framework and methodology that can accelerate the search for innovative solutions and new business models for a community, for a company and for a country. Solid innovation is what is needed to effect a sustainable brand image change. Paging PAL, paging the Philippines, your destiny is intertwined! I love PAL, I love the Philippines. 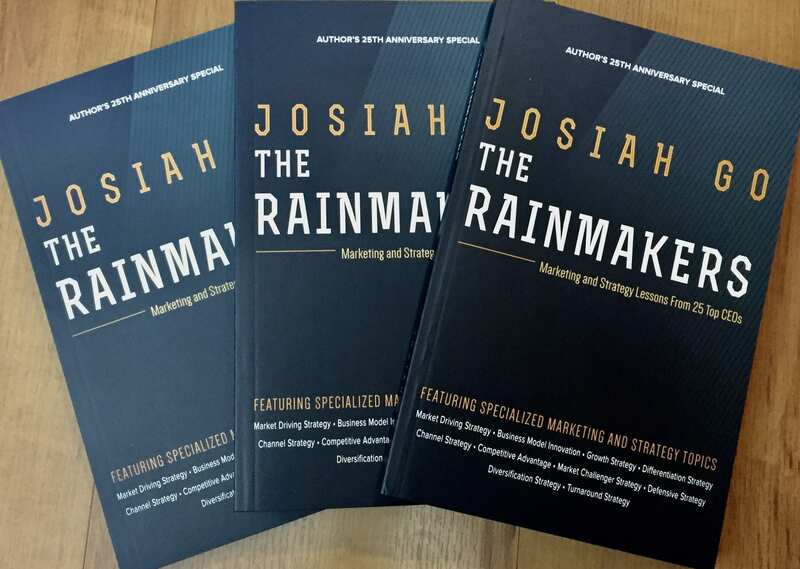 Josiah Go is chairman and chief marketing strategist of Mansmith and Fielders, Inc. (www.mansmith.net), the leading marketing, sales and innovation training company in the Philippines. He is co-author of the bestseller “Fundamentals of Marketing in the Philippine Setting” (2nd edition) with over 500 Philippine brands and companies cited as example. He can be contacted at josiah@mansmith.net. Please also send your marketing, sales and innovation questions to mentors@mansmith.net.